Today's doll is a girl I came across on my porch the other week. 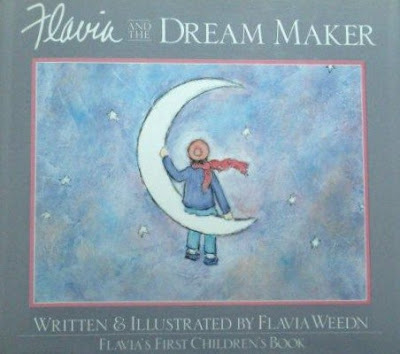 She's based on the illustrations and character 'Flavia' from the book "Flavia and the Dream Makers" by Flavia Weedn. It's the story of a little girl who dislikes her face,her name, and where' she's from, but finds that even the things she doesn't like can be special. 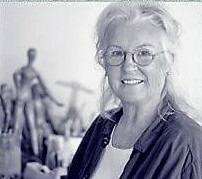 Flavia Weedn was an award winning author and illustrator. She published 17 books,including 10 children's books. She also produced a line of greeting cards, figurines, and collectible plates. She was known for her inspirational phrases. She passed away in 2015. I got Flavia a few years ago. Some how she got forgotten about and has lived in a box on my porch the last few years. She's gotten a little grungy and needs some clean up now,but she's still cute. She measures about 12" tall. She's very soft and floppy,so she can't actually stand up by herself. She has a stuffed bunny doll. Flavia has a soft dress,which is removable and Velcros in the back. Her scarf is also removable. I'm not sure about her shoes and sock. I didn't try to take them off. They look like they would come off though. I think the chair came with Flavia. They were in the box together. I am swimming in dolls right now. I have been trying to thin things out and have recently gotten rid of some things. I have to start rearranging my living room to make space for the Christmas tree too,so I have a lot to do. Last year I had most of my gifts bought, and all I had bought wrapped before December had even started. I thought that was great. I had never been so far ahead. But then I found I didn't feel 'Christmas-y' in December! So this year I am leaving the presents for a little while longer at least. I am proud to say I haven't wrapped a thing yet! I have done quite a bit of shopping though. I have Ken nearly finished,but barely a start on anybody else. I'll see you again tomorrow when we see what has recently floated to the surface of my ocean of stuff!